﻿ AIR WALLET - The Start of Cryptocurrency Utilization! Integrate APIs from your favorite exchanges into AIR WALLET so that you can check your crypto portfolio. From real time price monitoring to viewing detailed statistics on your investments, AIR WALLET makes it easy to manage all your precious assets in one platform. 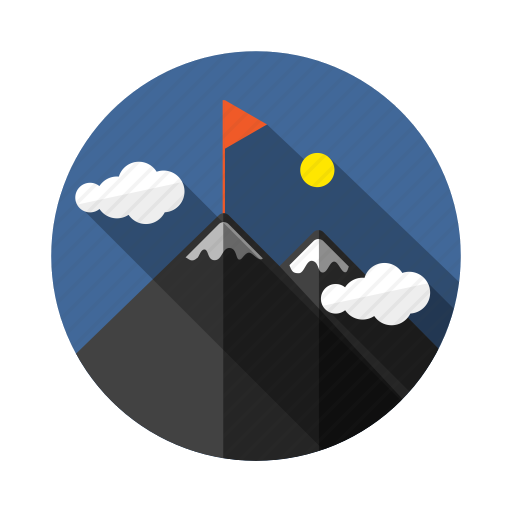 Earn rewards by participating in one of the many campaigns held within our platform. 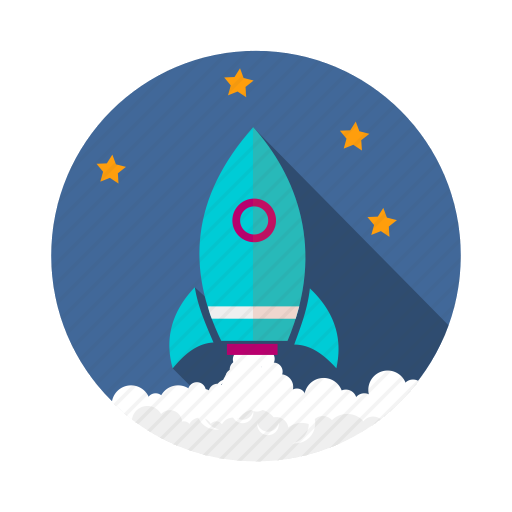 Whether it be through bounty campaigns from token projects or marketing request from companies, we make sure that there are plenty of ways to reward participants that contribute to each campaign. Browse through unlimited selections of products that are provided by local marketplaces around the world. Through the AIR WALLET marketplace, no one is held back by traditional currency payment barriers and restrictions based on location. Shop, purchase and earn rewards, all in one process. 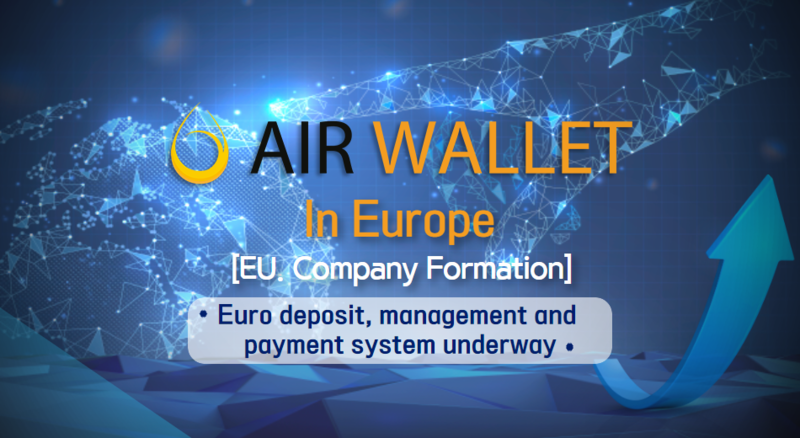 As a blockchain based cryptocurrency platform, AIR WALLET will enable cryptocurrencies to break barriers that exists in traditional currency markets and provide an efficient method of cryptocurrency payments across all global markets. AIR WALLET aims to become a leading platform by connecting cryptocurrencies to the economy and creating real life use cases. By combining a smart post sharing platform with e-commerce, AIR WALLET will present a Marketplace in which this token economy will operate on. When a company wishes to seek further acknowledgement on either their project or product, social media marketing is an inevitable step towards the success of the company. Through AIR WALLET, companies can request help from individuals on the AIR WALLET platform, by offering rewards in exchange for marketing outreach. Simply fill in the information you’d like to spread across social media and set a budget amount for that marketing campaign. Soon enough, users within the AIR WALLET platform will start letting others know about your company, product, or service, on their personal social media channels. Domestic product providers that wish to present their products to AIR WALLET’S global audience can do so by integrating their product list into AIR WALLET’S Marketplace. Here, consumers can purchase products, and companies can opt in to offer rewards to consumers for sharing purchased product reviews on the consumer’s social media channels. AIR WALLET’S Marketplace is not only a place where companies can sell their products, but also a marketing ecosystem that allows visibility for products to spread across social media. With a total supply of 4 Billion AIR Tokens, 30% of Tokens are allocated to the AIR Token sale, (and) or IEO. 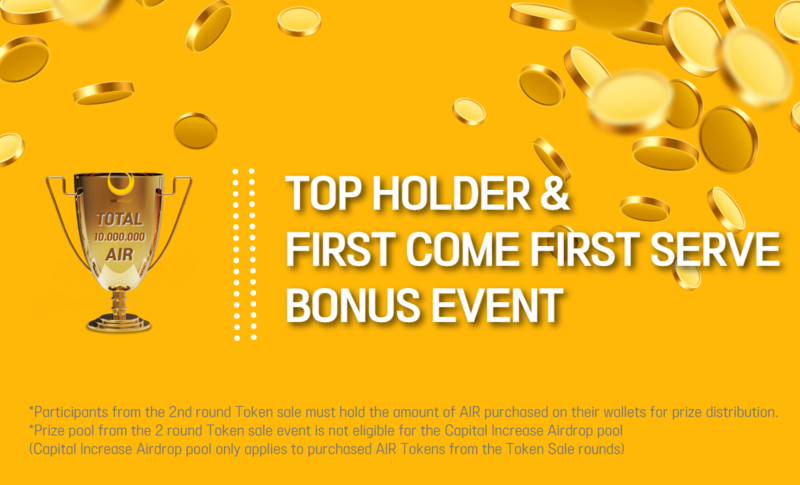 20% of AIR Tokens are allocated to the Capital Increase Airdrop Pool. After the completion of the Token sale (and)or IEO, all unsold tokens will be burned. 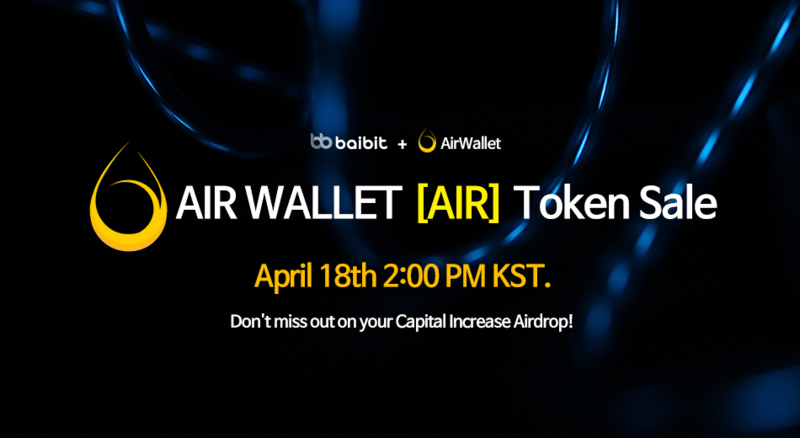 To provide a stable circulation of tokens within the AIR WALLET platform, 20% of the total AIR will be allocated to the Capital Increase Airdrop, of which all AIR token sale and IEO participants will be entitled to, along with all Airdrop and Bounty participants. The Capital Increase Airdrop token distribution snapshot will take place within 3 days after the listing on exchanges once the token sales have been complete. During the period of our snapshot, withdrawals and deposits will become restricted on the exchanges that have conducted out token sale rounds. Trading will happen freely within the 3 days and deposits and withdrawals will become available after the snapshot. To receive tokens from the Capital Increase Airdrop pool, participants from token sale round, bounty and airdrop campaigns must hold onto the AIR Tokens in the respective wallets until the time of snapshot to receive the tokens from the Capital Increase Airdrop pool. 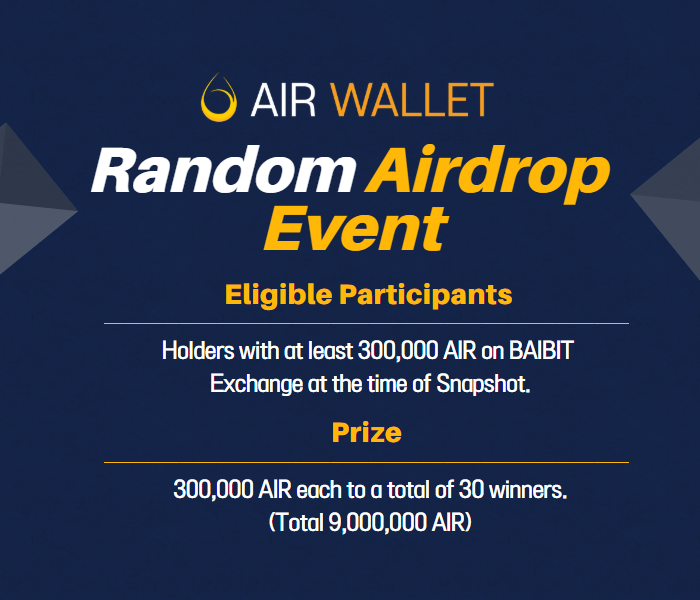 Bounty and airdrop participants will be able to deposit, withdrawal and trade after the time of snapshot on the respective exchanges AIR will be listed on. To thank all of our early investors, tokens from the Capital Increase Airdrop pool is to be distributed per the ratio shown below. Smart Contract Frontend/ Backend PecunIo, Profede, Clinicoin. B.F.A Digital Media, Master of Business Administration, USA. Enect Advisor, ASOBIMO Core Team (former), TRP | JP Ambassador. 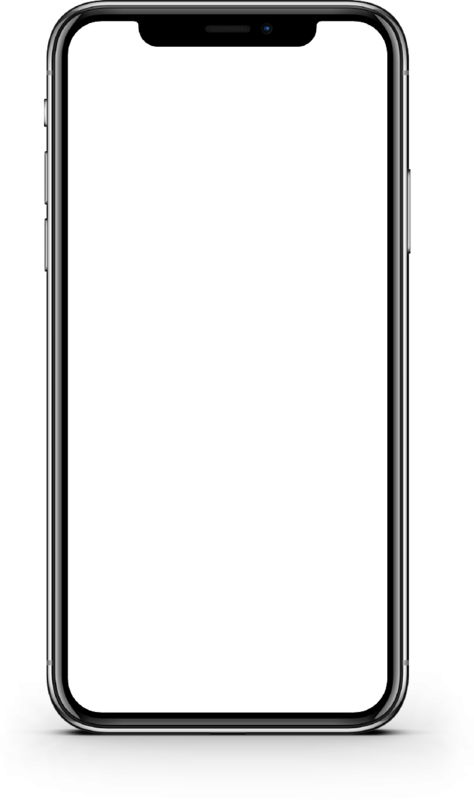 React Native, Full Stack 8+ years Mobile/Web. PHP, WordPress, Laravel, Node, React 7+ Years Web Developer. NodeJs, React Native, ReactJs 8+ years Mobile/Web. M.A. Industrial & Product Design ACM Seoul Tech Society FOSSASIA Project. Blockchain Solutions Ltd. Co-Founder Cheetah Africa Co-Founder M.S.C. Blockchain. 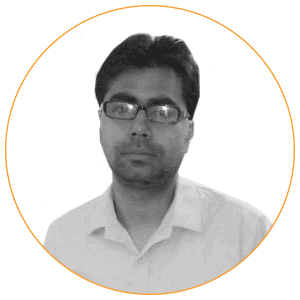 Block Patch | CEO, Former | Etherlab BD, Former | HMM Chief Office. LSware | CTO, Eyes Protocol | CSO, Former Extrus | CTO, Former Hancom Secure Director. 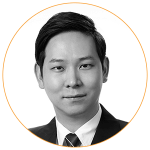 Galaxy Networks | CEO, Former Trebit CTO, Korea Univ. Information Securityh M.S.C. • SNS Mktg. Feature Dev. 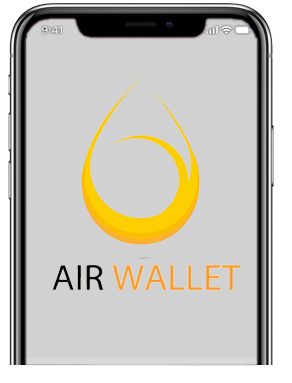 • AIR WALLET Web Dev.